“Daniel said: “In my vision at night I looked, and there before me were the four winds of heaven churning up the great sea. Four great beasts, each different from the others, came up out of the sea. “The first was like a lion, and it had the wings of an eagle. I watched until its wings were torn off and it was lifted from the ground so that it stood on two feet like a man, and the heart of a man was given to it. “After that, I looked, and there before me was another beast, one that looked like a leopard. And on its back it had four wings like those of a bird. This beast had four heads, and it was given authority to rule. The third was like a leopard . . . I believe this refers to India. Although the Scripture verse says that the beast looked like a leopard, my understanding is that the terms lion and leopard can be used interchangeably. At any rate, the original word in this verse, that is translated ‘leopard’, is used only one time in the entire Bible–and it is used figuratively. This may leave some room for interpretation. British heraldry (the art of designing and interpreting coats of arms, based on a formal system of rules) may offer some insight. In fact, just before India became a nation, it was a British colony–so I don’t think it is too far fetched to assume that British symbolism may be relevant. “The heraldic leopard differs from the real-life leopard (Panthera pardus). It does not have any spots and often has a mane. In heraldry, the leopard is also generally similar to a lion. The reason for this lies in the fact that in the Middle Ages leopards were thought to be a crossbreed between a lion and a panther. This was retained in heraldry. The difference between leopards and lions passant guardant is scant, if any, and the two terms are generally interchangeable. The beasts on the Coat of arms of England are generally referred to as lions. Symbolically, a leopard can be viewed as a smaller version of a lion–which could explain the significance of British colonies using leopards in their heraldry. 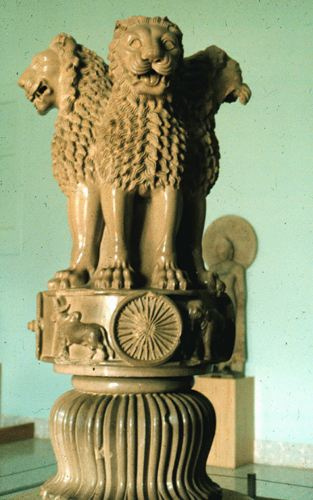 The four wings (two pairs) on the back of leopard represent Pakistan and Bangladesh, which broke away from India and became independent nations. ‘This beast had four heads’ . . .
August 15, 1947 Britain granted India its independence, giving it the authority to rule. Interpretation given in Daniel 7:17 is that each of the four beasts in Daniel’s vision is a kingdom ‘that will rise from the earth’. Good morning. Thanks for taking time to discuss this. I had never thought about the leopard referring to India, but this makes sense. When we think of their governments launching of an aggressive program to “number” every citizen of that country (by far the largest undertaking of this by any government ever) we can see some serious pieces of the prophetic picture coming into view. Thanks again for sharing the links to the Nathan Leal interview. I may place them in an upcoming twitter feed as well because I would like for them to be heard by as many people as possible. Thank you for your response. I have felt fairly certain ‘in my gut’ about India being represented by the leopard, but I did not known of ANY ‘logical’ reason that this would be true! You have added a missing piece to the puzzle! !